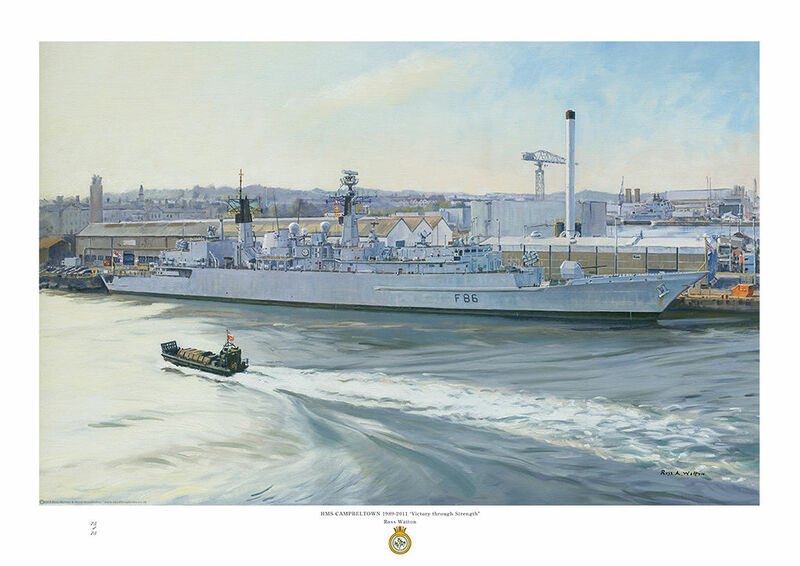 HMS Campbeltown (F86) a Batch 3 Type 22 frigate built by Cammell Laird Shipbuilders Ltd in Birkenhead, launching on 7 October 1987 and commissioning 27 May 1989. She is the second Royal Navy Ship to bear the name, her predecessor being used to deliver an explosive cargo during the St. Nazaire Raid, during World War 2. The latest HMS Campbeltown has seen extensive duty in the Persian Gulf and involvement in Operation Calash and Telic. Her length is 486 ft 9in, with a standard displacement of 5.300 tons and top speed of 30 knots. After 22 years service she decommissioned 7 April 2011. The picture shows the ship at Devonport dockyard. Original painting is sold.